Do you want to use a specific query for retrieving objects used for running an admin generator? For example, you want to display information about related database records but you see that generating such page generates lots of SQL queries? It's very easy to set a custom query for admin generator in Symfony! You need to do only 1 simple thing - override the buildQuery method in your actions.class.php (of an admin module). parent::buildQuery() is the default query retrieving data for the admin. You may modify it as muh as you want (or you may even build your query from the beginning). The most important use of this feature is decreasing number of SQL queries, which makes an admin panel work a lot faster! "%value%" is not an integer. In one of the previous posts I've briefly described how to set up multiple connections in a symfony project. This time I'll show how to set up multiple connections to distinct databases which have exactly the same structure. Suppose we work for a company that runs few E-commerce shops that are based on the same open source software package (like magento, osCommerce or prestashop). Let's say, there are 3 different shops: shopA, shopB and shopC. Of course, each of them is provided with its own admin application (standard for open source software). And this creates a problem: the more different admin applications employees need to access, the more time it will take to do a simple task. The solution is to create a center administration application (written in symfony framework) to manage everything that is accessible in our shops (could be something else, not only shops). Therefore, our new symfony application will access 4 databases, 3 for shops: shop_a, shop_b, shop_c and the last, most important one, admin for the entire admin application which needs its own database. We don't need to have so many base classes, which define exactly the same model. So we'll do some tricks! They can be quite complicated at first sight, but don't worry. Something I probably wouldn't manage without is a versioning system (even if I'm the only developer). This is because lots of operations on files will be made - and a versioning system makes it really easy to work with. The following article is based on SVN. Since all shop databases share the same structure (but different content - e.g. different pics, different prices), there's no need to create different (lib/form/filter) base classes for the ORM - they'd be the same afterall. You don't have to rename tables in your shop databases. Usually open source packages use a table prefix: wp_ for wordpress, ps_ for prestashop and so on. If you want to create full set of classes for each database, you are forced to use a different prefix for each database (which may be what you don't want to do). Create separate schema files for admin and shop databases: all admin database structure goes to admin.yml file and the shared shop database structure goes to shop.yml file. Use default schema.yml file as a temporary/buffer file. Now our libs include only those files which we need (all 'temporary' files are removed). You can find similar script in another article, outsourcing applications with symfony. I've described my solution for symfony access to many databases sharing the same structure (with different content). I'm absolutely aware of the fact that there may be better ways to solve this problem, but this one is the easiest & fastest - in my opinion. Please, feel free to share your opinions and suggestions! 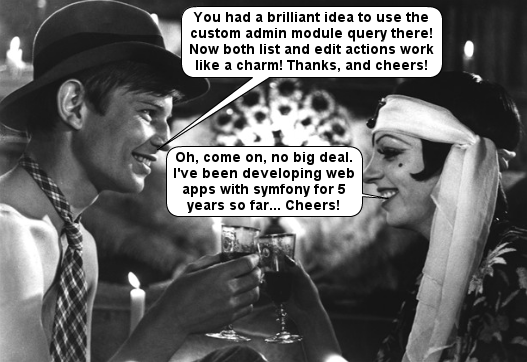 Symfony gives you a possibility to use lots of third party libraries. One of them, extremely useful while developing backend of your application, is tinyMCE. The symfony core team has created the sfFormExtraPlugin which helps you to attach tinyMCE to your projects. But there's a lot more you can do to make this editor satisfy your needs. I'm assuming you have properly installed the sfFormExtraPlugin inside your project. First of all, you need to install tinyMCE on your own. Go to the download page, and put the extracted content inside your project's web directory. The downloaded archive includes tinyMCE usage examples, you may remove them and include only the tiny_mce directory inside your /web/js directory. TinyMCE is properly installed in our app already. Now it's time to set the inputs to use it. Run your backend application and check if everything is OK.
Lots of us may create websites for non-English communities, therefore custom language support is needed. Of course, there are more specific attributes you may want to change. Unfortunately, the sfWidgetFormTextareaTinyMCE class provided with the plugin is hardly configurable. The best solution is to create a custom class extending it and override all the attributes you need. Let's get our custom language working with the tinyMCE now. Go to the language pack download page. Choose the language(s) you want to install, check them (do not download the xml files since you'd have to compile them into the .js files) and press the download just below the end of the list. Move the zip archive into the tiny_mce directory and extract it there. All language files will be extracted in the appropriate places. So far, so good. and your language pack should already work fine. Of course, you may not need all of the tinyMCE features, feel free to modify the code. Just to make sure, such installation enables all tinyMCE features on your frontend application, such as emoticon images. Play with it! Hope everything will work fine. Any feedback is appreciated. I had a task to implement a newsletter system for a sf 1.4 project. It was quite simple: an anonymous user from outside can subscribe to the newsletter (storing his E-mail address in the database). The site admin can create a newsletter article (with simple properties like title and content). When the send button is pressed, this article is sent to all subscribed E-mails. Now all formatting was shown properly. 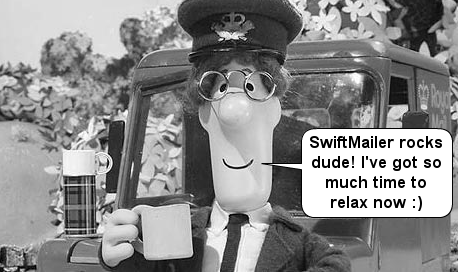 Implementing a newsletter with Symfony & Swift is really easy!